This model is known to run in OpenCell and COR to recreate the published results. The units have been checked and they are consistent. ABSTRACT: Although alternans of action potential duration (APD) is a robust feature of the rapidly paced canine ventricle, currently available ionic models of cardiac myocytes do not recreate this phenomenon. To address this problem, we developed a new ionic model using formulations of currents based on previous models and recent experimental data. Compared with existing models, the inward rectifier K(+) current (I(K1)) was decreased at depolarized potentials, the maximum conductance and rectification of the rapid component of the delayed rectifier K(+) current (I(Kr)) were increased, and I(Kr) activation kinetics were slowed. The slow component of the delayed rectifier K(+) current (I(Ks)) was increased in magnitude and activation shifted to less positive voltages, and the L-type Ca(2+) current (I(Ca)) was modified to produce a smaller, more rapidly inactivating current. Finally, a simplified form of intracellular calcium dynamics was adopted. In this model, APD alternans occurred at cycle lengths = 150-210 ms, with a maximum alternans amplitude of 39 ms. APD alternans was suppressed by decreasing I(Ca) magnitude or calcium-induced inactivation and by increasing the magnitude of I(K1), I(Kr), or I(Ks). These results establish an ionic basis for APD alternans, which should facilitate the development of pharmacological approaches to eliminating alternans. 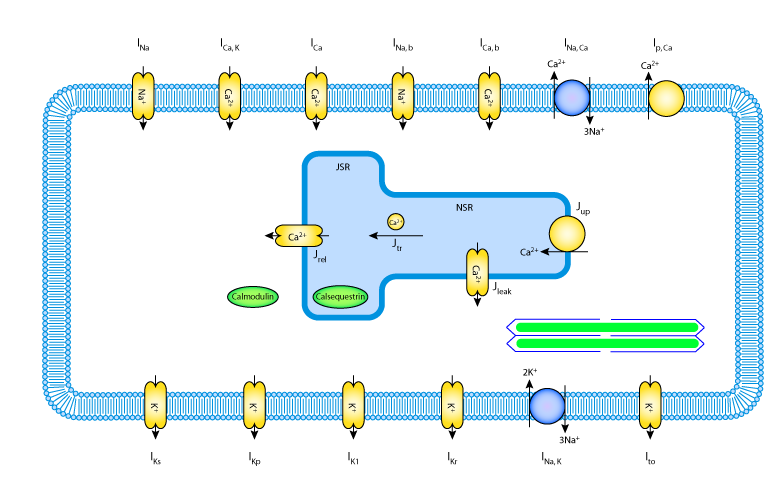 A schematic diagram describing the current flows across the cell membrane and the calcium fluxes between the cytoplasm and the sarcoplasmic reticulum that are captured in the Fox et al. canine ventricular cell model. Derived from workspace Fox, Mcharg, Gilmour, 2002 at changeset d296ce29bef2.